There have been plenty of wild finishes in the 57 editions of the iconic Rolex 24 At Daytona. 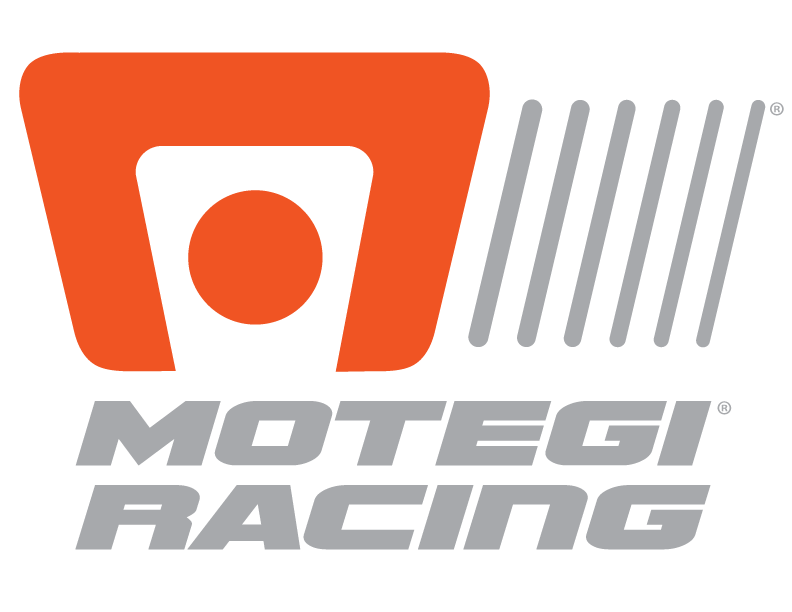 But arguably none have been wetter than Sunday’s rain-shortened conclusion of the 2019 IMSA WeatherTech SportsCar Championship season opener, in which the No. 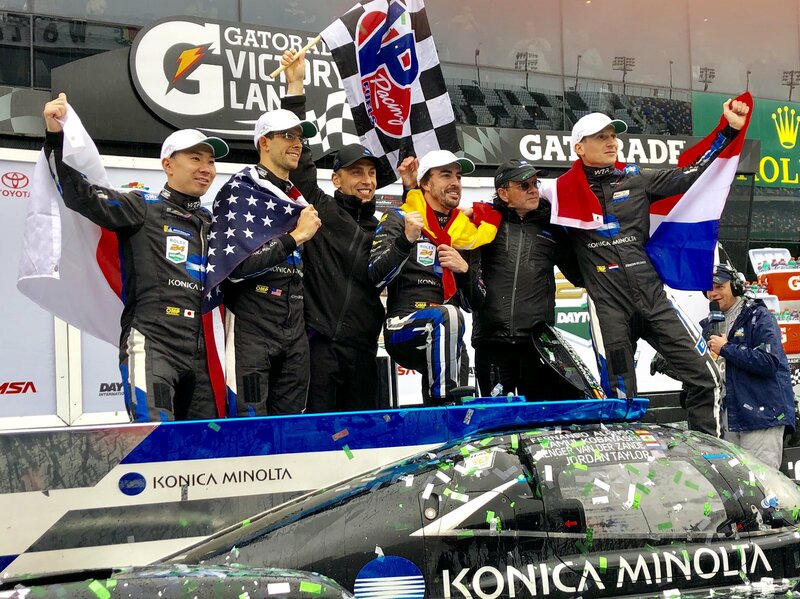 10 Konica Minolta Cadillac DPi-V.R team, with its all-star driver lineup of Jordan Taylor, Renger van der Zande, Kamui Kobayashi and Fernando Alonso, weathered treacherous conditions to score its second victory in the last three events at Daytona (Fla.) International Speedway. One of those wild Rolex 24 finishes came just two years ago, when Taylor’s older brother and then co-driver Ricky Taylor won a furious battle in the closing minutes to earn the Taylor brothers their first career Rolex 24 victory alongside third and fourth drivers Max “The Ax” Angelelli and four-time NASCAR Cup Series champion Jeff Gordon. This year, the younger Taylor brother was joined by 2018 full-time co-driver van der Zande alongside former Formula One and current World Endurance Championship regular Kobayashi, and two-time Formula One world champion Alonso. 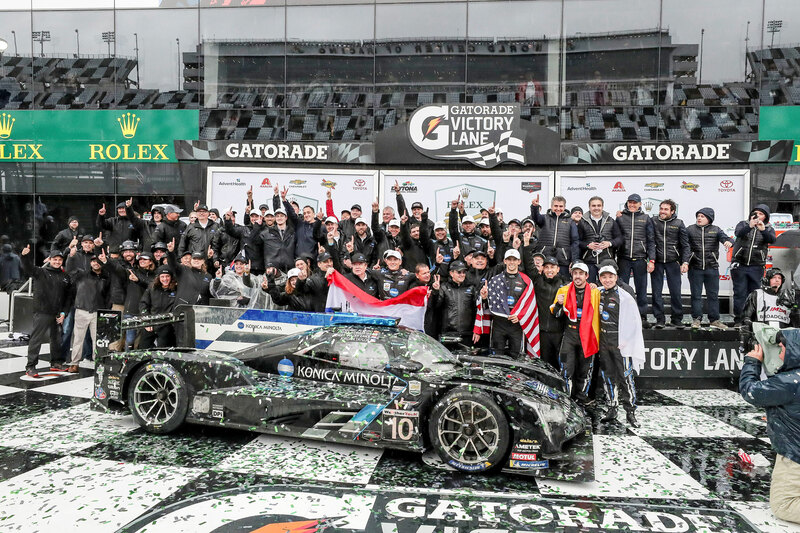 And the fearsome foursome turned a highly anticipated Rolex 24 victory into reality with their driving consistency and ability to stay out of trouble through all hours of the day and night, in conditions that ranged from fast and dry to chilly and extremely wet. Together, they led a race-high 249 of 593 laps around the 12-turn, 3.56-mile superspeedway road circuit from the sixth qualifying position earned Thursday by Taylor, who equaled the two career Rolex 24 victories earned by his three-time sportscar-racing-champion father and team owner Wayne Taylor, and helped his teammates each earn his first career Rolex 24 win. Alonso, in fact, became just the third Formula One world champion to win a Rolex 24, joining Phil Hill and Mario Andretti. The Spaniard also scored a first career victory in the 24 Hours of Le Mans last June. After struggling to crack the top-five all through practice and qualifying in lead-up to Saturday and Sunday’s twice-around-the-clock endurance marathon, it took little time for the No. 10 Konica Minolta Cadillac DPi-V.R to find its way to the lead. Taylor’s ultra conservative opening stint yielded just one lap led during a round of green-flag pit stops. But once Alonso got behind the wheel for his first race stint just shy of the two-hour mark, the sleek, black racecar found itself in and out of the lead for the remainder of the event. Alonso promptly raced his way into the lead, and logged 44 laps led before turning the car over to Kobayashi just past the four-hour, 30-minute mark. 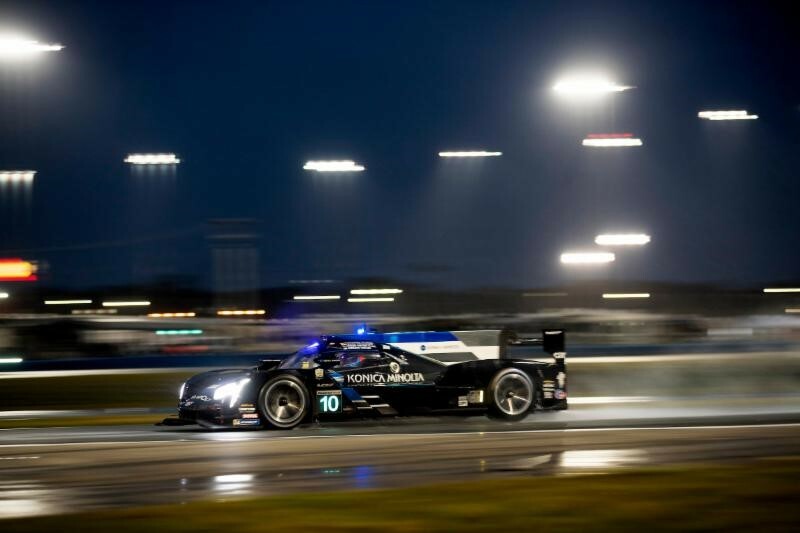 Like Alonso, his Toyota Gazoo Racing teammate Kobayashi executed a strong and steady stint keeping the Konica Minolta Cadillac in the lead for 72 of his 87 laps on track before handing the car over to van der Zande at the seven-hour, 27-minute mark. The 32-year-old Dutchman, who most recently brought home a thrilling win for the team on the last turn of the last lap of last year’s season-ending Petit Le Mans at Road Atlanta, played it relatively conservatively during his opening stint and led 18 laps before handing the car back to Taylor in the wee hours of Sunday morning. The racecar remained strong through Taylor’s second stint, in which he led 45 laps before turning things over to Alonso just short of the 15th hour of the race. But, shortly after Alonso took over, expected rain showers finally arrived, and varying degrees of precipitation would remain through the rest of the day. He led 49 laps in all during the mostly wet stint, which included an almost two-hour red-flag period for extreme wet conditions through the track at the 16-hour, 43-minute mark. Alonso continued for a short time after the race resumed at the 18-hour, 31-minute mark, leading several more laps before handing the car back to Taylor just short of the 19-hour mark. Taylor’s final stint of the weekend netted 17 of 43 laps led through very wet conditions. It featured a powerful pass of the No. 31 Action Express Racing Cadillac DPi-V.R of Pipo Derani at the 19-hour, 20-minute mark, then a remarkable maneuver to avoid a spinning GT-class car ahead of him under heavy braking into turn one. Then came the final stint for Alonso, who resumed in third place and carefully bided his time before positioning himself to take advantage when Derani’s teammate Felipe Nasr ventured off course in turn one and giving the No. 10 Konica Minolta Cadillac DPi-V.R the lead for good at the 21-hour, 54-minute mark. The race was red-flagged three laps later as Alonso and most of the rest of the field reported near zero visibility under heavy rains just short of the 22-hour mark. Officials waited for a chance to restart the race until the 23-hour, 49-minute mark before waving the checkered flag, and celebration ensued in the No. 10 Konica Minolta Cadillac DPi-V.R camp.